It’s a quote which seemingly could come from almost any book about holy wells written in the last fifty years. 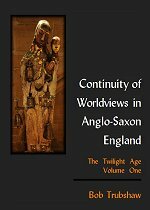 Yet, as Jeremy Harte has painstakingly established in his book English Holy Wells, there is little evidence for ‘holy wells’ which predate Christianity. On the one hand is a widespread popular belief which deems all wells to have be places of pagan worship. On the other, is the scant evidence which is rarely sufficient to satisfy historians or archaeologists of ritual activities. In part this is because the written sources relating to holy wells are usually uninformative – perhaps nothing more than a passing mention – and also because there are few opportunities to excavate around wells. Even when archaeologists do, they can only make the most generalised assumptions about any surviving objects were there. But the exceptions can be dramatic. One of the few major ‘digs’ at or near springs in recent years continues to reveal a remarkable quantity of Mesolithic flints. This is the site at Amesbury known (misleadingly) as Vespasian’s Camp and more blandly as Blick’s Mead. 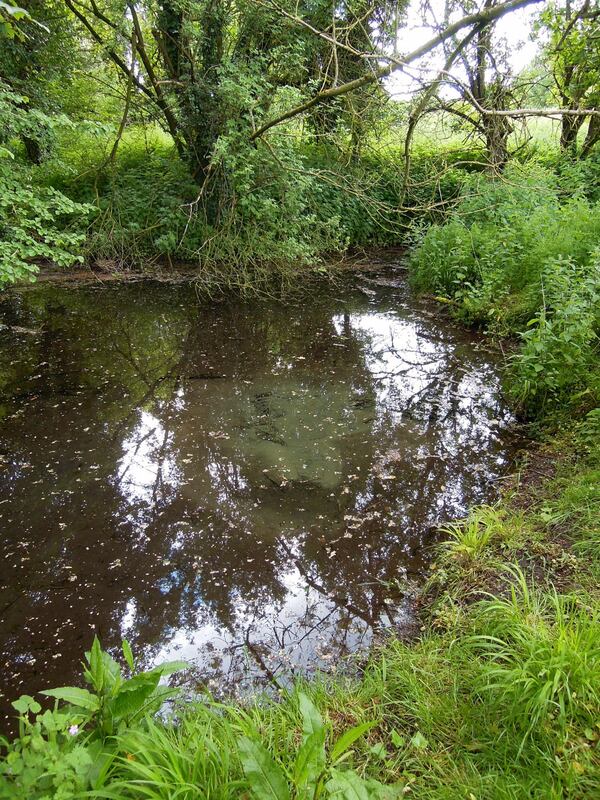 This riverside spring-fed pool was clearly a place where a great many generations of Mesolithic people gathered, long before the construction of Stonehenge just a short distance to the west. 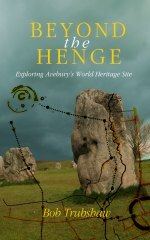 Indeed, it is little more than a stone’s throw from the start of the Avenue which leads from the banks of the River Avon to the megaliths themselves. Not to be confused with a river of the same name which flows through Warwickshire and into the Severn, this Avon starts life Wiltshire and flows southwards through Hampshire into the Solent. The whole catchment area contains a wealth of Neolithic archaeology. Clearly this was a river system which acted as a major communication route in prehistoric times. 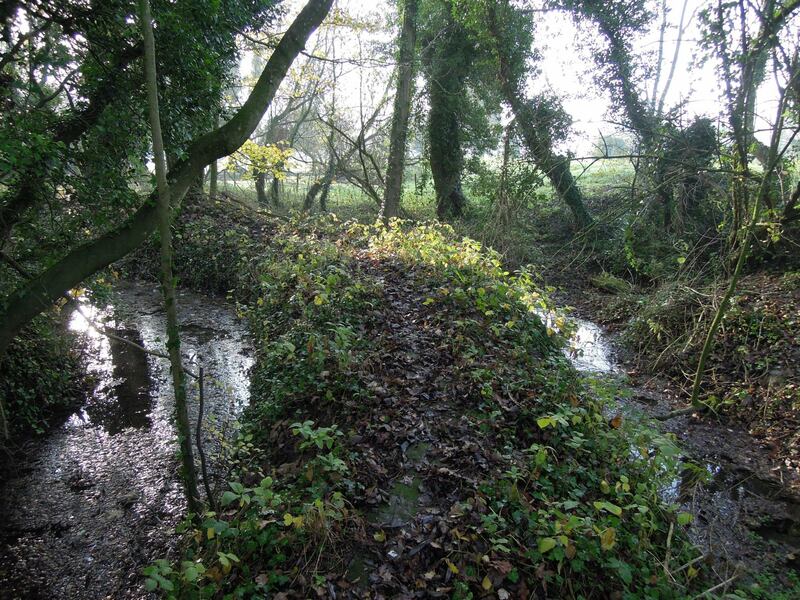 The water flowing past Blicks Mead has already come past two other major Neolithic monuments – the ‘mega-henges’ at Marden (now reduced to fragmentary banks and ditches) and Durrington Walls. And, further upstream, the source of all the water is in various springs nestling under the chalk escarpment which looks down on the Vale of Pewsey. Along the summit are several early Neolithic causewayed enclosures and various Iron Age hillforts. The Anglo-Saxon Wansdyke is the most recent of these major earthworks. The best-preserved of the causewayed enclosures is Knapp Hill. Alongside it is the contemporaneous early Neolithic chambered long barrow now known as Adam’s Grave but formerly as ‘Woden’s bury’. The ditches and mound align with midwinter sunrise. 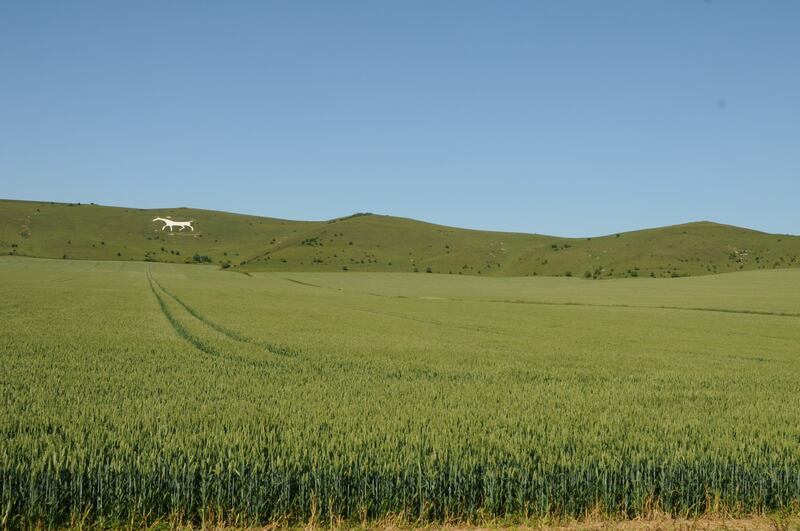 Just a little way to the west is one of the most impressive of the hill figures in Wiltshire – the Alton Barnes white horse. Adam’s Grave as seen from near the springs. 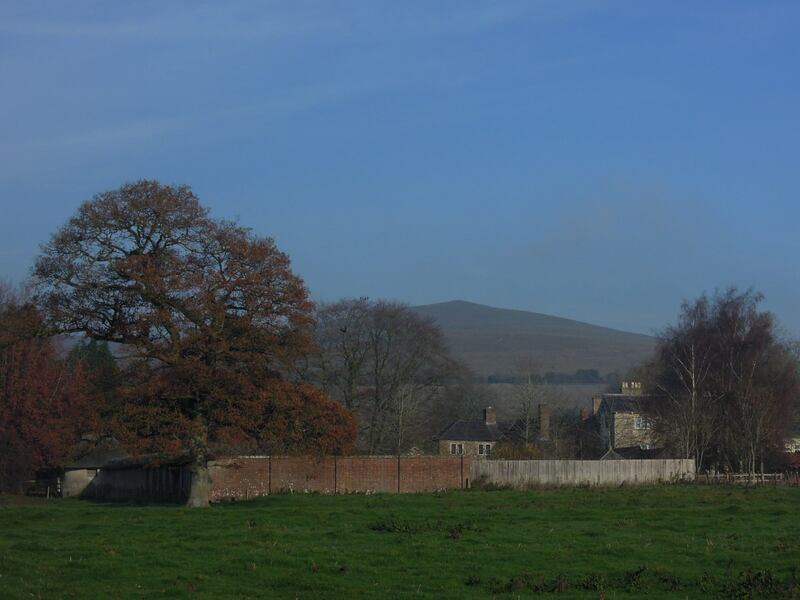 The white horse is out of shot to the left and Knapp Hill causewayed enclosure out of shot to the right. Alton Barnes and Alton Priors are overlooked by the chalk escarpment. On the skyline, left to right, are the white horse, The Neolithic long barrow now known as Adam’s Grave and the well-preserved Neolithic causewayed enclosure on Knapp Hill. The white horse, the long barrow and the causewayed enclosure are all prominent on the skyline when standing near a small wood situated between the settlements of Alton Barnes and Alton Priors. Both hamlets have small churches, one with an Anglo-Saxon nave and the other built a few centuries later but with a massive hollow yew tree in the small churchyard. Lift one of the two trapdoors in the floor of the church and you will find a ‘buried standing stone’ – although, truth be told, no one is sure why it is there or whether it ever stood upright. 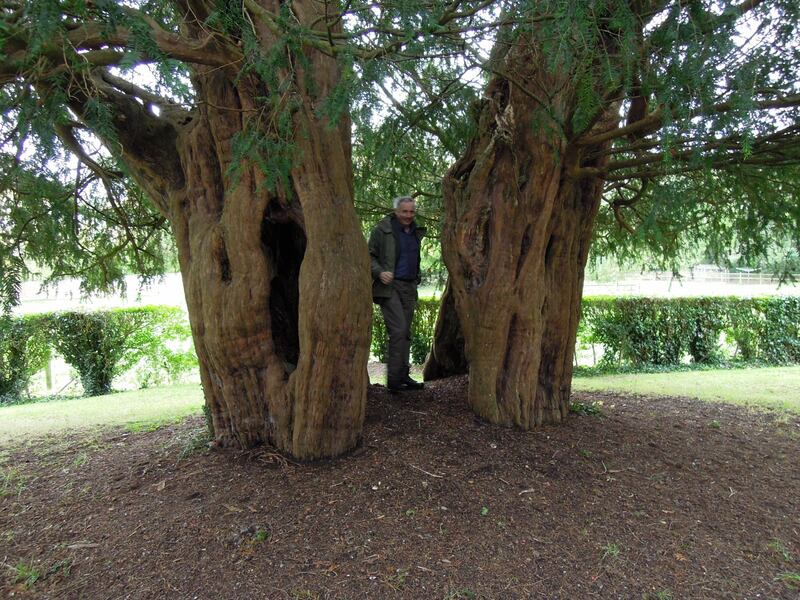 Jeremy Harte standing inside the ancient and hollow yew tree in the churchyard at Alton Priors. Both churches and the nearby prehistoric monuments are all well worth visiting. But the real interest is in the small wood. Two rickety stiles provide access. Within there are two spring-fed pools, each flowing into separate streams which eventually converge – on a map they look rather like a blue tuning fork. The water in each pool is crystal clear. Several times a minute small bubbles break away from various spots at the bottom of the pools and form ripples on the surface. These are from air released as the water escapes from the local chalk aquifer into the pools, and the only visible evidence of the water flowing into the pools. A close-up of the clear area where bubbles rise up frequently from the chalk at the bottom. 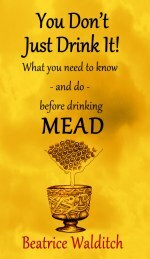 The Anglo-Saxons knew this as the source of the Avon. The modern name ‘Alton’ was spelt Aweltun in 885. It means literally ‘the farmstead at the well or source of a river’. I have been to many muddy patches in fields, seen plenty of dilapidated stone structures, and all such modern evidence of sites which in medieval times were considered to be holy wells. But none of them have the sheer magic of the Alton springs. Knowing that the water gently bubbling up will, in the next few days, flow past Marden, Durrington Walls and Stonehenge, adds to the enchantment. 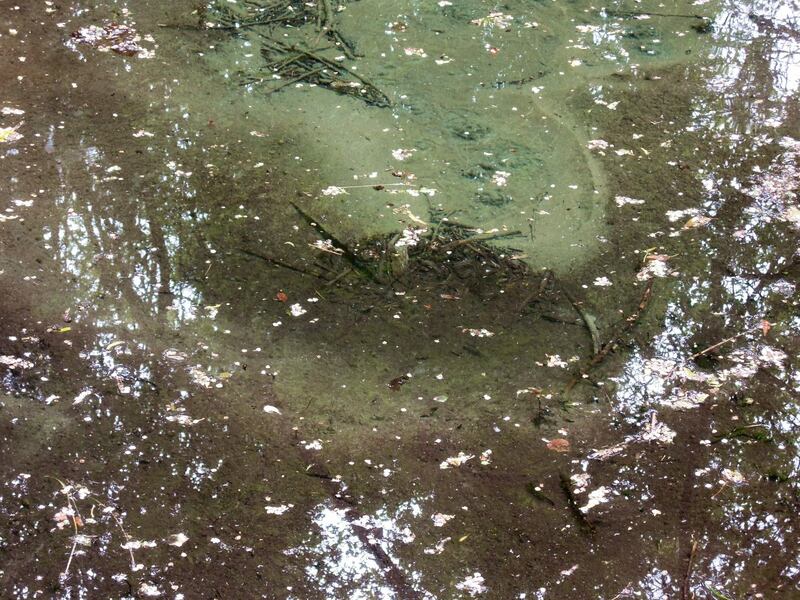 To my knowledge there has been no archaeological activity near these two springs. Yet the presence of the causewayed enclosure and long barrow all-but confirms that Mesolithic and Neolithic people would have used this is their source of water. They too would have been aware that this was the source of the river which defines the region. In all probability there are as many buried flint tools in the vicinity of these pools as have been discovered at Amesbury. Who knows what long-gone perishable organic artefacts there might have been as well. If you ever want to experience standing beside ‘sacred waters venerated ever since people have been living in Britain’ then visit these spring-fed pools at Alton. Guest blog for Autumn James Rattue. 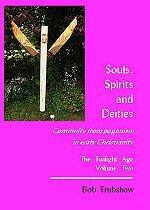 Posted on August 19, 2014, in Favourite site, Folklore, Pagan gods, Wiltshire and tagged alton priors, alton priors white horse, Bob Trushaw, Heart of Albion. Bookmark the permalink. Leave a comment.